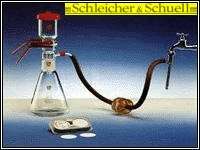 Vacuum Filter Holders | Tamar Laboratory Supplies LTD.
A variety of fluid vacuum filter holders from Schleicher & Schuell MicroScience will suit your research applications. In addition to general applications for laboratory filtration (such as gravimetric analysis; bacteriological control of water; foodstuffs and beverages; pharmaceutical and cosmetic products mostly for residue analysis),these holders are most suitable for a number of special filtering jobs like biochemical analysis, radio chemical analysis, alkaline and corosive solutions purification, investigation of sediments, contamination control, etc. Units are made of glass, stainless steel or plastic.